Pretty Purple Necklace Box it looks fantastic and presents Large Pendants & Necklaces Beautifully helping to increase your Sales. This Pretty Purple Necklace Box has a Hinged Lid with a lovely white flock inner which sits up at an angle to display your Jewellery. 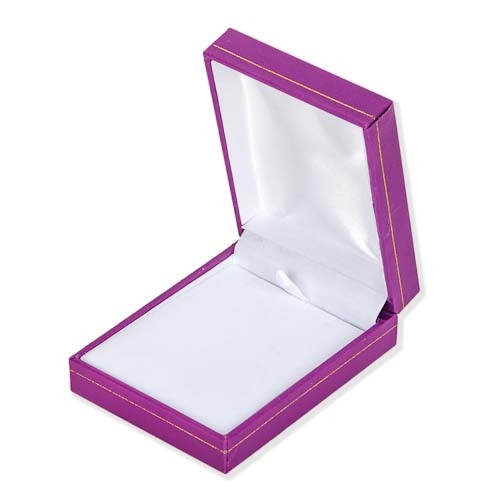 This Pretty Purple Necklace Box looks fantastic and presents our Large Pendants and Necklaces Beautifully so it really helps to increase your Sales. Small Pendants also work well in our drop earring box. This Pretty Purple Drop Earring Box has a Hinged Lid with a lovely white flock inner which Stands up at an angle to display your Necklaces and large Pendants. It is 69mm wide by 80mm long & 28mm deep. This website is strictly for approved Wholesale customers only, if you are looking to buy this Pretty Purple Necklace Box from a retail store, please visit Shooting Star. Absolutely Stunning Faceted Amethyst Cross. This Lovely Hand Made Sterling Silver Amethyst Pendant has 5 Fantastic Quality 7mm x 5mm Oval Faceted Amethyst Cabochons together with 1 round 6mm Faceted Cabochon. Approx height excl bale 1". Comes boxed together with a card giving the qualities of Amethyst. Silver Chains & Earrings are also available.